Understanding internal martial arts is to understand sensitivity drills. 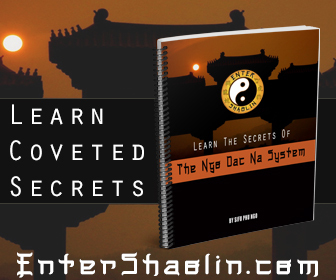 Wing chun and other styles like it relies on a persons ability to feel energy. I know to some folks it sounds strange but that is exactly what we do. We feel a persons intention through their body. In many situations it appears that we can read a persons mind, but that isn’t true at all. A lot of stories have been passed down throughout the centuries of feats of great martial artist of the past. While there is some truth to the stories I am sure, many of the myths that have been spread comes from the fact that someone with an untrained eye watching a display of skill could easily misinterpret what is actually going on. The videos in this post are just one of many different sensitivity drills. It is important to understand that these drills are designed to teach a practitioner how to feel a persons intentions and deal with their energy. Understanding how the body responds to different stimulus is essential to effectively counter attacking your opponent. What is your intention? There are really 2 types of attacks a person will use. Both type of attacks have their place in combat, however like a finger print each type of attack is unique and FEEL different. Committed attacks are actually easier to counter than false attacks for obvious reason. If a person is committed to punching you in the face, you will know it because the energy will be driving right to the point of the planned attack. Generally once a person makes the decision to attack, their body starts to act on it. 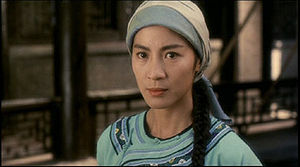 The point of wing chun sensitivity drills is to understand how your body should respond to a persons physical actions. Once you learn how to read a persons intentions it becomes easier to defend against your opponents attacks as well as feel when it is right to attack. All of this happens in a blink of a eye. Which is about how long it takes for you to feel a persons intention, especially under live conditions. 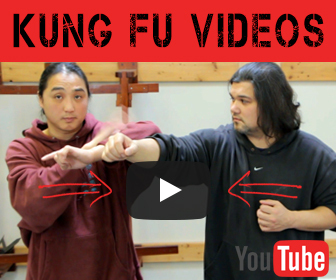 Wing Chun Sensitivity Drills have gotten a bad rap by lots of folks. That is because they don’t understand the purpose of them. Sensitivity training is to prepare you for combat. Training like Chi Sao isn’t fighting. Rather it is a way to develop the skills you need to bridge the cap between training and fighting. There was a time many many moons ago when martial arts wasn’t about competitions or ego for that matter. It was about self – preservation. The need to survive is a ancient one. For the most part the world has forgotten how to feel energy, its much easier today to just get a gun and shoot someone. There isn’t a real need for swords or fighting skills in todays society. So the real skills of styles like wing chun have been forgotten, except for a handful of people around the world who treasure these lost arts. Make no mistake, a person who is highly skilled can whip the pants off of someone who isn’t. I am not talking about sports, I am talking about pure survival where their are no rules, corners, tap outs etc…. Ultimately the person who can gain pressure control and control their own adrenaline is usually the person who wins. 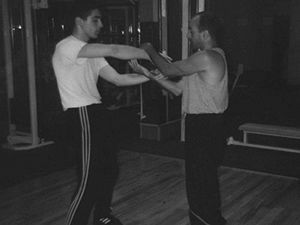 Wing Chun sensitivity drills aids a person in understanding both. These are very good drills. We use similar “sticky hands” type movements in Kali knife-fighting. They really increase your reaction time and hand speed.